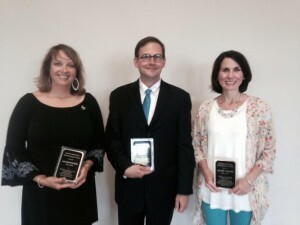 2015 SHS Hall of Famous inductees Anne Stricklin, Briar Jones, and Amy Ellis McReynolds. Briar Jones, who holds a Bachelor of Architecture degree from Mississippi State University, is a partner at Thomas Shelton Jones & Associates. He has distinguished himself as an architect, historic preservationist, supporter of the arts and artist in Mississippi and beyond. Jones’ leadership resume includes the Greater Starkville Development Partnership Board of Directors and Committee of 100, Mississippi Heritage Trust, Starkville Area Arts Council, the City of Starkville Historic Preservation Commission, as well as being an Eagle Scout. Jones is President-elect of the Starkville Rotary Club. Jones has received multiple awards for his architectural projects, including Renasant Bank (Starkville), First State Bank (Meridian), the Greater Starkville Development Partnership Building, and the Wilkinson County African American Museum (Woodville). An award-winning artist, Jones’ works have been recognized locally and around the country. Briar lives in Starkville with his wife Michelle and son Giles. Amy McReynolds received her Bachelor of Science Elementary Education and Master of Science Elementary Education degrees from Mississippi State University. She holds two National Board Certifications (1999 and 2009) and has been an elementary and art teacher in the Starkville School District since 1993. McReynolds has been recognized multiple times for her outstanding contributions to teaching and education, including winning the Presidential Award for Excellence in Mathematics and Science Teaching (2008), Starkville School District Teacher of the Year (2008), and the Starkville Rotary Club Merrill Hawkins Award for Excellence in Education (2010). McReynolds has broad experience mentoring and training teachers in Mississippi, and has served as a reviewer for Presidential Award for Excellence in Mathematics and Science Teaching. Other leadership includes serving as Elementary Vice President for the Mississippi Council of Teachers of Mathematics, District Representative for The Mississippi Professional Educators, serving on the Mississippi Mathematics Framework Revision Team, as well as being a double presenter at the National Staff Development Council Conference. Amy and her husband Eddie have two children, Lawson and Reece. Anne Stricklin received a Bachelor of Arts in English from Abilene Christian University and a Master of Arts in English from Mississippi State University. She has been a tremendous advocate for the Starkville School District since returning home to Starkville in 2008. Since that time, Stricklin has served as PTA President of both Overstreet and Ward Stewart Elementary Schools as well as Executive PTO President of the Starkville School District. She has served on several Starkville School District councils and committees in both official and unofficial capacities, including the Superintendent’s Roundtable the Strategic Planning Team. She organized the Overstreet School History Project as well as the Maroon Friday Tee Shirt Project, which to date has netted over $12,000 for SSD’s PTO. Stricklin’s impact on the Starkville/Oktibbeha County School District consolidation cannot be understated. She has tirelessly worked to garner support for consolidation, engaging leaders on both local and state levels, and dedicated herself to promoting public education in Starkville and beyond. Anne and her husband Scott have two children, Abby and Sophie.